The Environmental Design Pocketbook 2nd ed places the information you need for sustainable, low energy building design at your fingertips. Packed with diagrams, tools and tips, it cuts through the complex mass of technical data and legislation that faces the designer, and distils all the key guidance into a single reference that is quick, easy to use and points to the facts, figures and performance data that are most important. This 2nd edition is now fully up-to-date with the latest Building Regulations Part L and F legislation (England and Wales), RIBA Plan of Work 2013, new information on the Green Deal and Zero Carbon and contains revised references and further reading sections throughout. Whether used in the classroom, office or on-site, the book guides the designer through the entire process; from the fundamentals to the building details. From future-proofing for a changing climate to rainwater harvesting, retrofit, and zero-carbon technologies - the Pocketbook has got it covered. 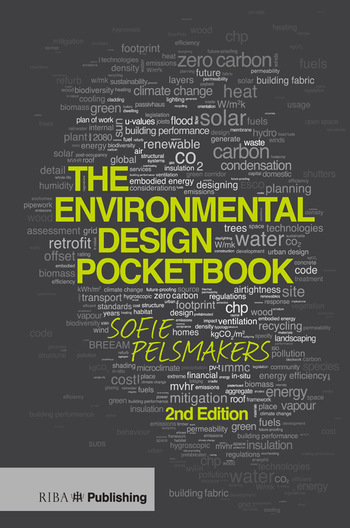 Sofie Pelsmakers is a PhD doctoral researcher at UCL’s Energy Institute. She co-founded Architecture for Change with Stephen Choi in 2011 and has worked as a consultant at the STBA, UK Passivhaus Trust and Levitt Bernstein Architects. Sofie taught environmental design at the University of East London for almost 10 years, where she also led the MA Architecture: Sustainability & Design programme from January 2009 to the end of July 2011.